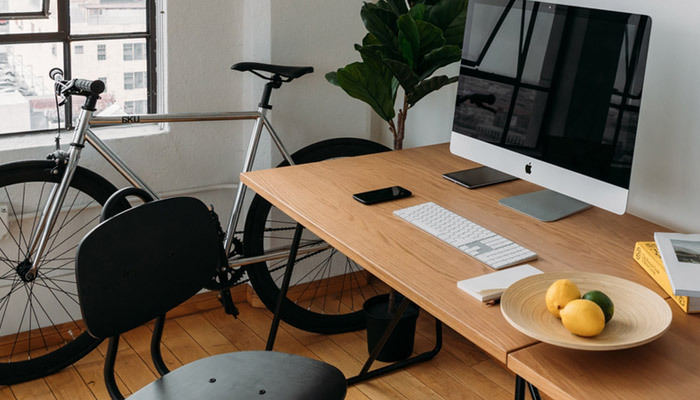 Last month I wrote about useful Mac apps for freelancers, tools that I have found to be useful, save time, and help me stay organized. 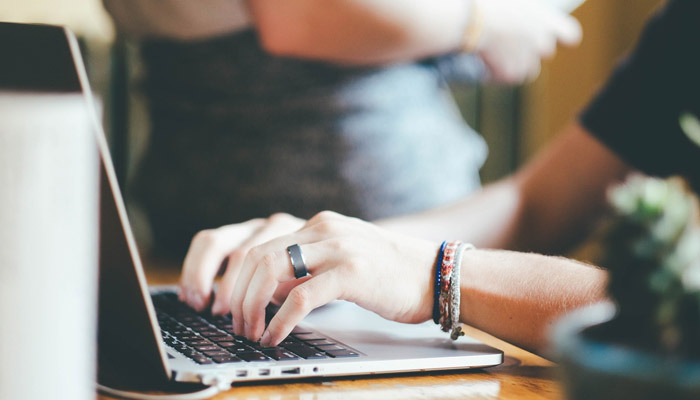 I couldn't just stop at the previous list, however, so here are seven more useful Mac apps for freelancers. 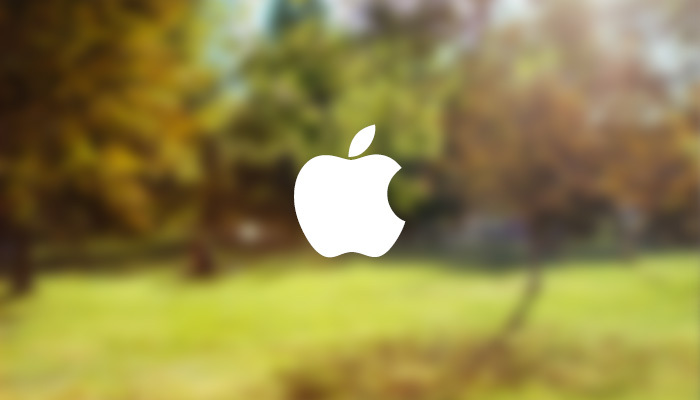 As I mentioned in the previous post, these apps may not be Mac-only, but many of them are. I have always used Google Calendar because it is always in sync, and just works. I have also become fond of the built-in SMS messages within Google Calendar as well, to remind me about important phone calls and other scheduled events. While the Apple Calendar is nice, and does sync with Google Calendar, I found myself wanting something small that would sit in the menu bar, where I could quickly look at the events scheduled for the day. This is one of Fantastical's greatest strengths, how small it is and how it is always a click away and lets you get back to what you were doing. Another great feature of Fantastical is how you can just as easily add tasks to your calendar by typing them in in plain English. For example, I could type "Lunch with Mike at Northstar Cafe tomorrow at noon" into the quick entry bar, and everything would be placed appropriately on the calendar, the event would be "Lunch with Mike", the location "Northstar Cafe", and of course, the time and date would be appropriately set. It's the Calendar that does exactly what you want it to do, when you need it, then it gets out of the way. One of the best ways to reduce stress is to write down what's on your mind. It's stressful to try to remember all of the things that float around in our heads. Sometimes those things are brainstorming ideas, and writing them down in prose fashion in a text editor is just not going to cut it. For example, if I have a project coming up for a client that involves x number of features, and each of those features is going to have y number of requirements, a mind map is a great way to hash it all out. MindNode allows you to quickly and easily brainstorm out mind maps to help you organize your thoughts, and visualize them in a non-linear fashion. 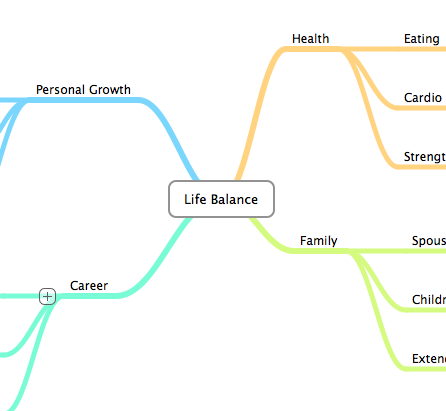 I've created mind maps before for projects, for my business in general, for marketing plans, or seeking balance in my life. They can be an effective tool once you learn how to create them, which is fortunately pretty easy with MindNode. I tend to love all things Mac, but one thing that I've always hated about OS X is how seemingly useless that green circle button is in the upper left of windows. Coming from Windows, I was used to that button making things fullscreen. There are many utilities out there that hijack your system once installed and change the functionality of that green button, and the best one that I've tried is called Moom. 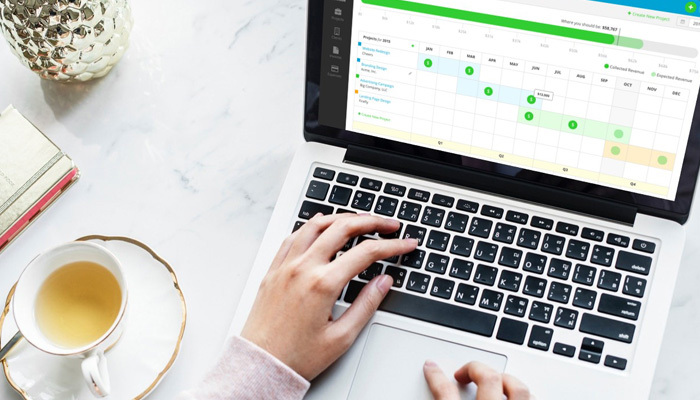 With Moom you can set the green button to display a grid, so you can even quickly choose which layout you'd like the window to take, just in case you want to do something different from a full-screen, like two windows side-by-side. There are also keyboard shortcuts that you can set. On my larger monitor, I am constantly putting windows side-by-side, so setting a key combination has been a huge time-saver for me. We are inundated with information on the web today. From links people post on Twitter, to RSS feeds, things people email you, and articles you run across while browsing the web for other information. This stuff Just. Keeps. Coming. Pocket is here to help. 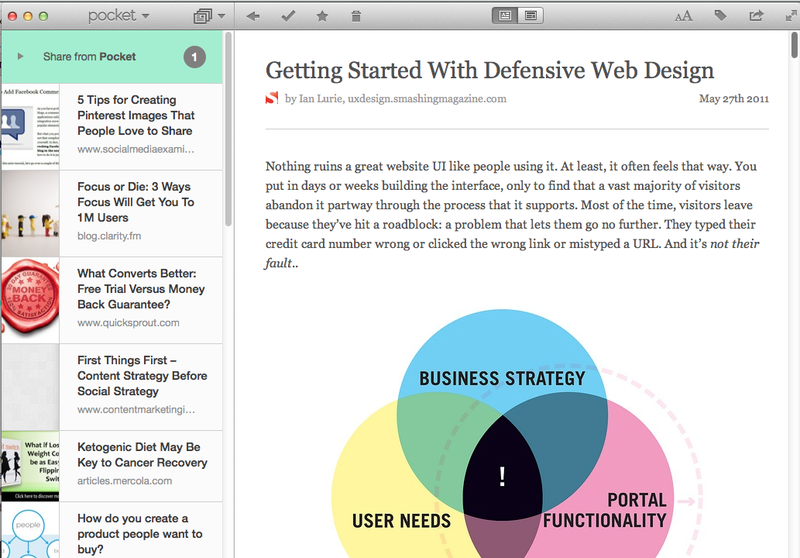 You can click a bookmarklet in your browser, and save an article to Pocket to read later. You can then fire up the free app on your Mac, iPhone, or iPad and read the article in a newly formatted, content-optimized design [read:ads removed]. So when those articles come in during the day, just Pocket them and read them later when you have more time to focus. There are a lot of timer utilities out there, and some even tie into your invoicing software, making it easy to bill your clients for your time. However, for some freelancers, hours are not all billable, and there are many items that you may just want to track how long they take you to accomplish. This is a good practice not only for learning how to run your business more lean, but also to review at the end of the day what you accomplished (ironically, it can be hard to remember some days). 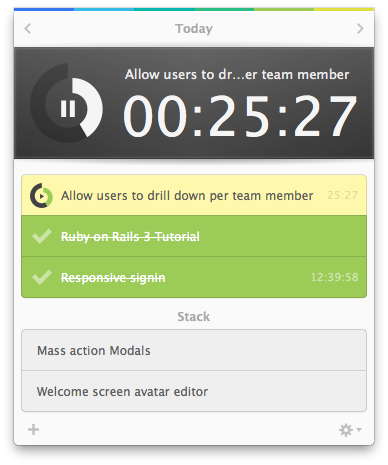 Snail was built to allow you to list tasks, then attach timers to them. It is a pretty basic feature-set, but that is one of it's strengths. It also runs out of your menu bar, so it is there when you need it, but also gets out of the way. If you haven't read David Allen's book "Getting Things Done", I highly recommend that you do so. One of the main tenants of the book is to break projects down into actionable steps, and to write these things down as soon as possible. Things is one of those tools that was built from the ground up to fit into this methodology. 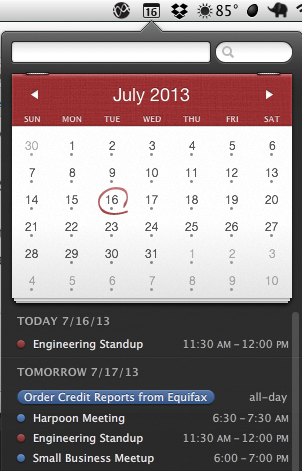 With each task, you are able to assign tags, due dates, and notes. Sometimes the "notes" section is where I complete the task at hand, for example, coming up with survey questions for an upcoming talk, I can put them right into Things for easy reference. There is a lot this tool can do, such as organizing what you have to do for that day, and allowing you to temporarily put projects into the "Someday" folder, to be brought back out when the time is right. 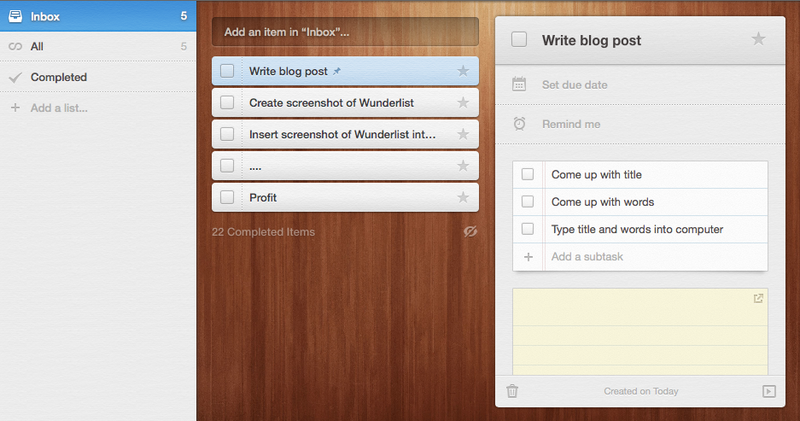 Wunderlist is similar to Things, but it is insanely beautiful, and free. It is slightly simpler in feature sets compared to Things, but it might be more than sufficient for the casual user. 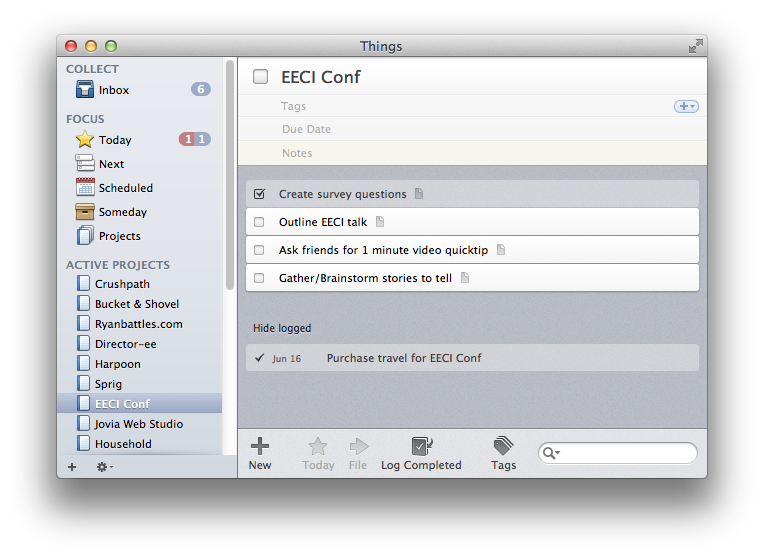 Because I already own Things, I tend to use Wunderlist for short-term projects that I can accomplish within a day. One of the nice features of Wunderlist that hasn't made its way into Things yet is sublists, so if you think you might use this feature, then Wunderlist may be the superior tool.